Hello once again! I'm back to present my project for this month's challenge over at Berry71Bleu. The challenge for the month of January hosted by fellow DT member Denise is: 'Your Little Word for 2014'. I've picked the word 'Patience'. I feel that I lack patience in several aspects of my life. At work, at home even with my crafting. I seem to be in a rush and I've been in this rush for quite some time. It's getting to the point that I feel like I'm missing out on important things simply because I'm under this self inflicted rush to get things done quickly. I especially feel that I'm missing out on important aspects of my son's life. He's currently 14 months old & I'm under this awe; wondering where the first year of his life went? It seemed to have passed by so quickly & I question myself often. Was I present in his first year as much as I should have been? Did I take the time to enjoy the small things that with time--mean so much? So with this in mind I've decided to stop, take a deep breath and take my life one day at a time, one hour at a time, one minute at a time. There's no need to rush through life. Time passes fast enough without me having to rush it along! This layout is a prime example of patience. 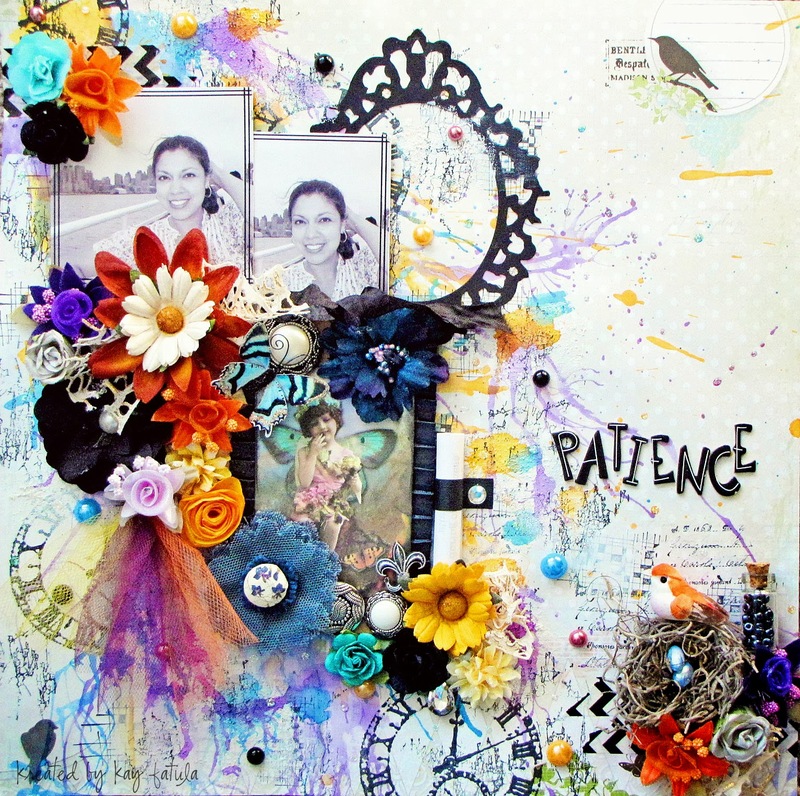 I have several mixed media items in my crafting stash--yet I rarely do a page consisting of any mixed media. Why? Simply because I don't have the patience for it!? Sometimes with mixed media you have to allow the mediums to dry or set and oh my...tick tock, tick tock, tick tock--I just don't have the patience for it. Yes, even with the use of my heat gun I still feel like I'm losing precious minutes & seconds blowing hot air onto my page. Tsk, tsk, tsk...yes my impatience really is that bad! So for this page I took the time to use a few mixed media. I've used gesso, texture paste a variety of mists & lots of stamping. My flower clusters are composed of a variety of different colors & flowers. I've tucked a bit of web ribbon in between my clusters to dress it up a bit more. Here you can see the texture paste. I added mists and stamping right onto the texture paste once it dried. The stamped clocks along my page represent the concept of time and how I hope to take my time with several aspects within my life. My journaling was stored in a scroll which is my absolute favorite way of storing my thoughts & feelings. There's a tutorial on how I create these journaling scrolls here. So what's your little word for 2014? Make sure you take the time to check out the other DT's take on this month's challenge & play along if you can! There are some really great prizes up for grabs for a few lucky winners. Thanks for stopping by & enjoy the rest of the week!